(Cheyenne)- Cheyenne will host an overnight stop on the 2016 Hemmings Motor News Great Race presented by Hagerty Wednesday, June 22, race organizers have announced. The Great Race, the world’s premiere old car rally, will bring 120 of the world’s finest antique automobiles downtown to Depot Plaza for the event. The race will start June 18 in San Rafael, Calif., and finish June 26 in Moline, Ill., on the banks of the Mississippi River. This year’s race winner will take home a grand prize of $50,000 and the this year’s total purse is $150,000. Along the 2,400-mile route, competitors will travel parts of the Lincoln Highway in six states – California, Nevada, Utah, Wyoming, Iowa and Illinois – in addition to a side trip to South Dakota to see Mount Rushmore and the Badlands. The Great Race, which began 33 years ago, is not a speed race, but a time/speed/distance rally. The vehicles, each with a driver and navigator, are given precise instructions each day that detail every move down to the second. They are scored at secret check points along the way and are penalized one second for each second either early or late. As in golf, the lowest score wins. The cars will arrive in Cheyenne starting at 5:15 p.m. at one-minute intervals for two hours. 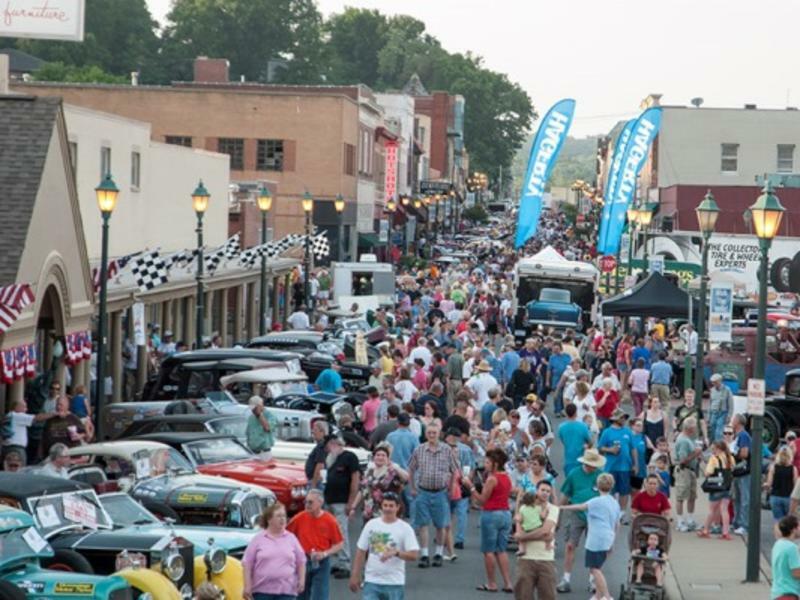 Each stop on the Great Race is free to the public and spectators will be able to visit with the participants and to look at the cars for several hours. It is common for kids to climb in the cars for a first-hand look. Cars built in 1972 and earlier are eligible, with most entries having been manufactured before World War II. In the 2015 Great Race a 1916 Hudson Hillclimber won the event when it finished on the Santa Monica Pier. That vehicle, driven by Fairport, N.Y., native Howard Sharp and navigated by his son Doug, will again be in this year’s event. They won $50,000 for finishing first overall. A 1916 Hudson Indy Racer, a 1916 Hudson Four Passenger Speedster, a 1916 Chevrolet Phaeton, a 1917 Peerless Racer and a chain-driven 1918 American LaFrance Speedster are the oldest cars in the event. The event’s main sponsors are Hemmings Motor News, Hagerty, Coker Tire, Reliable Carriers and Toyota. For more information, go to www.greatrace.com or contact Jeff Stumb at jeff@greatrace.com or by calling him at 423-648-8542.